Those greens! Those blues! That lavender! Claude Monet’s stunning use of color served as my inspiration this week. I chose the particular painting shown above as an example because it’s an example of some of Monet’s most vivid use of color. I find multiple colors difficult to manage in a single look, so this was a real challenge for me! This look is all about color and luminosity, so I was bold with my color choices and liberal with Benefit’s High Beam. I also avoided harsh edges and when for a hazy effect around the eyes with no liner or brow pencil. I’ll be honest: I’m not completely happy with this look. I think I should have eliminated one of the bright colors because it looks a bit too rainbow-y, in retrospect. But I’m still working on my blending abilities so this was fun practice. Applied BB cream & concealer. With a more substantial foundation I'd use a brush, but for now just used fingers. Used NYX's Taupe Blush for contouring & High Beam for highlighting. Taupe is a great shade for contouring on us fair girls; bronzers look too orange to be natural! Primed lids with UD's Primer Potion and then NYX's Milk so the colors will show as true as possible. Then, I topped it off with a bit of off-white shadow to make blending those vivid colors as easy as possible! 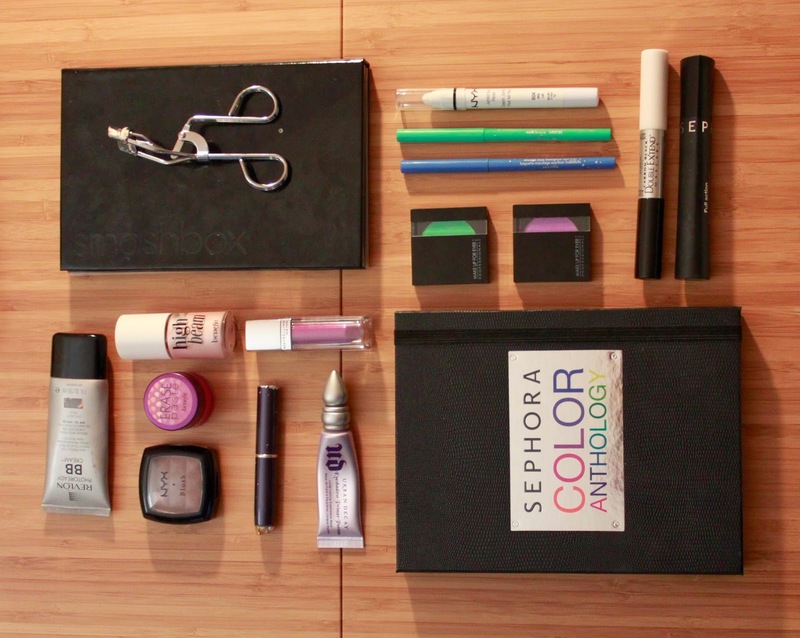 Often with a dramatic eye, I'll use a light gray or beige to "sketch out" the shape I want. Did that here in the crease a bit. Woohoo, color time! This is a bright matte yellow from Sephora's palette. Not the most pigmented unfortunately, and it shifted around a bit while I finished the look. Added on the MUFE green "blush" just on the outer third of my lid. Added a matte turquoise from Sephora's palette; this one was a much better quality shadow than the yellow. Added the MUFE "blush" in lavender to the inner lower corners, and sketched in where the deeper blue will go on the lower lid. Added in Smashbox's Azure in the crease. This is a gorgeous color but can be hard to blend; make one mistake with a harsh line and it's almost impossible to correct! I like to use a shade of shadow that matches my skin in those cases to help blend. 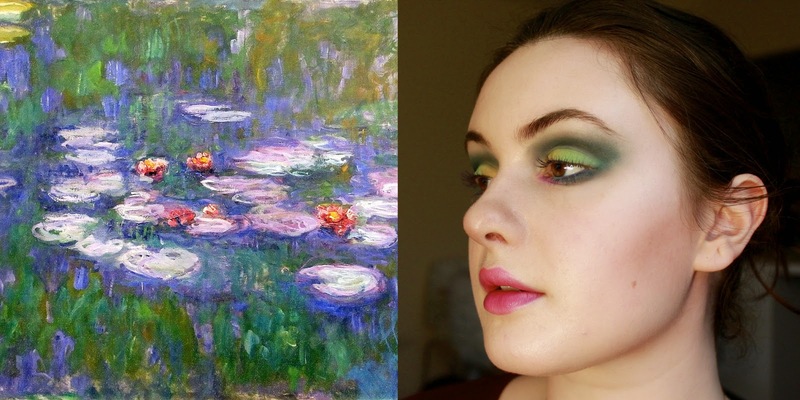 I wanted the shape of this eye to be a rounded rectangle, mimicking the shape of the lily pads in Monet's painting. Added a bit of grey in the crease to intensify the contrast. You'll notice that in this look I didn't use any eyeliner. A straight line is to Monet's Water Lilies what a cheeseburger is to a sushi restaurant; you just won't find it there! It's about turning up the volume on nature, using intense color and shapes to create a composition. Same goes for my brows. I didn't fill them in or define them to keep this look soft. Continued to blend & added some High Beam to my brown bone (or what you can still see of it!) Also added Stila's colorful liners to my lower waterline. Curled my lashes & added on the purple mascara. Applied Maybelline's Vision in Violet in a rosebud shape, exaggerating the cupid's bow and under-drawing the corners to mirror the blooms in the painting. This color is much more glossy and, well, violet straight out of the tube but I used it as more of a stain here. 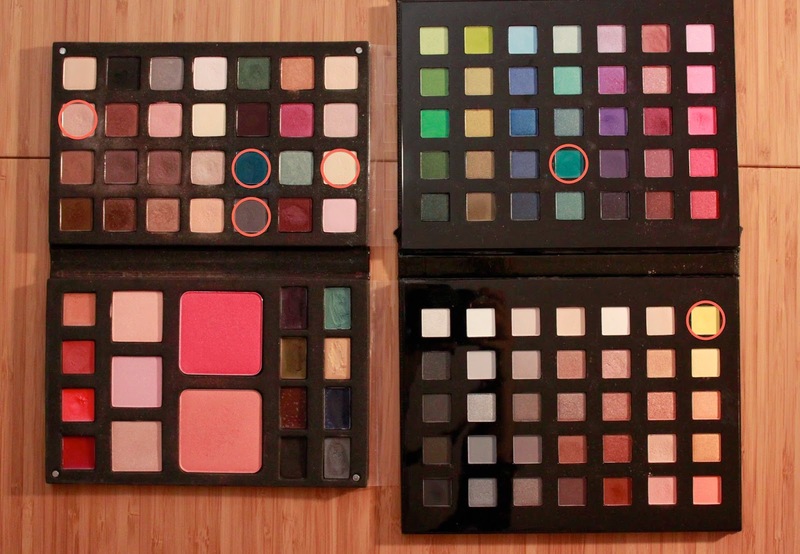 And here are the palette images I mentioned. Hope you liked this look and I'd love to hear your thoughts. Would you wear makeup this bold out-n-about? This is so beautiful! Great tutorial!